If you’re staying current with health news you probably know sugar is public enemy #1 to total health. While some of this may be hyperbole (the part about the shotgun is) there’s no escaping the fact sugar can be extremely harmful to your health. And since most Americans consume far more sugar than is healthy, I want to explain how exactly sugar can harm your bones. And while excessive dietary sugar may lead to a host of health conditions (elevated blood sugar levels are linked to many of the most dangerous health conditions in the modern world) there is a way to get your blood sugar under control. Best of all is the methods I use for improving blood sugar are 100% natural and shown to work just as well as conventional treatments. First off, when I say sugar can harm your bones, I’m referring to dietary sugar. Because many Americans consume excessive sugar in their diet (in the form of complex carbohydrates and regular old table sugar) it leads to elevated blood sugar levels. And there are strong links between elevated blood sugar and compromised bone health. Truth be told we don’t know the exact cause that leads elevated blood sugar to negatively affecting bone health. That being said since dozens of other dangerous conditions are linked to elevated blood sugar there’s no good reason not to get it under control. One of the most convincing theories about how elevated blood sugar may lead to bone damage comes from how elevated blood sugar affects body weight. Odds are if you struggle with blood sugar issues it means you’re likely overweight. The interesting thing about being overweight is while it usually increases bone density, it still leads to a higher incidence of bone trauma. Part of that has to do with how many people who are overweight lead a more sedentary lifestyle (which is known to interfere with bone health). A sedentary lifestyle leads to the weakening of muscles, ligaments and tissues around the bone which exposes bones to shearing forces that may cause them to break. An overweight individual’s most innocent movements can exert excessive pressure on bone structure which may result in a fracture or break. 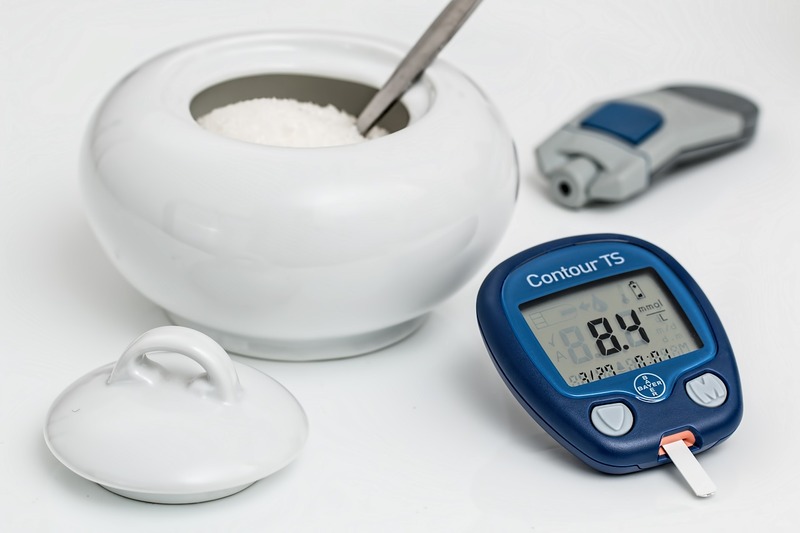 Another issue that may explain how bone health is affected by blood sugar has to do with how blood sugar affects the amount of insulin circulating in the body. Insulin is the hormone that controls blood sugar. If blood sugar levels are too high it actually limits how much insulin is produced. And when insulin production is lowered it wreaks havoc inside the body. While insulin isn’t directly involved in the production of bone, researchers believe people with problems regulating insulin are at a greater risk for compromised bone health. A study published in the Journal Bone Mineral Research noted that when insulin levels were low thanks to high blood sugar it resulted in lower femoral bone strength under load. This is a big deal as the femur is the biggest and strongest bone in the body, and if it’s weakened because of high blood sugar levels it shows many other bones could be even more damaged. And probably one of the most convincing theories about how elevated blood sugar can harm bone health has to with what excessive blood sugar does to your cell’s mitochondria. The Journal of BioMechanics observed that people with known blood sugar issues may experience disruptions in mitochondrial function that lead to “increased cortical porosity” (how porous bone is) and decreased overall strength. The research on how elevated blood sugar affects bone health is continuing to this day. And yet the fact remains, getting your blood sugar under control isn’t just good for your bone health… it’s great for your total health too. I have a two-step formula I use for helping my patients for improving their blood sugar and helping protect their bones. The first thing I tell them to do is to change how they eat breakfast. Research shows if you switch your breakfast over from one high in carbs (AKA sugar) and low in fat to a breakfast high in fat and low in carbs it has a tremendous effect on balancing blood sugar. A breakfast made up of 75% fat, 20% protein and 5% carbs is one of the most effective at keeping blood sugar in the healthy range and helping to protect bones. Now here’s the problem with my primary suggestion. Many of my patients find it difficult to remain consistent with that kind of a diet without a bit of help. As blood sugar rises throughout the day (based on stress or diet), it can short circuit their plans to eat a healthy high-fat breakfast the next day. That’s why I recommend taking berberine in addition to eating a high-fat breakfast. Berberine is one of the most well-studied supplements on the planet and research shows it’s probably the best supplement for helping improve blood sugar ever discovered. What’s unique about berberine and how it helps to improve blood sugar has to do with how it activates a particular cellular enzyme called Adenosine Monophosphate-activated Protein Kinase. Activating AMPK is clinically shown to be one of the most effective methods for improving blood sugar. In fact, many of the most popular medications prescribed for blood sugar management rely on activating AMPK to improve blood sugar. When AMPK is activated it sends a signal to your cells that’s very similar to the signal they receive during intense exercise. This signal instantly increases your metabolism which causes your body to then consume available blood glucose as fuel, which will then lead to improved blood sugar levels. Activating AMPK is so effective at improving blood sugar that many of the major pharmacological treatments available rely on AMPK activation to improve blood sugar. This yellow powder just happens to do it without any side effects… and at a fraction of the cost. It’s so good at activating AMPK that clinical research shows it outperforms pharmacological counterparts by 50-200 times in this regard. This appears to be the main mechanism for how it increases insulin sensitivity and improves blood sugar. And the reason I give it to patients is because there’s a long list of clinical studies showing it helps to improve blood sugar. When combined with my recommendation for eating a high fat breakfast the odds your blood sugar will improve significantly are staggeringly high. Did You Know Vitamin K-2 Helps Improve Blood Sugar Levels?